If the images of cupcakes, cherries, and bingo balls seem appealing, you will want to check out Scrummy Bingo, one of the tastiest looking bingo sites around. Bingo players of all types are certain to relish this beautiful site, which dishes out a wide variety of bingo games, access to top slots and large jackpot prizes to boot. It’s an easy site to navigate, with registration taking just a couple of minutes and switching between bingo rooms taking just a couple of seconds. You will find bingo games starting from just 1p a ticket and slots games don’t break the bank either. To kick things off, you will be excited to claim the £15 free no deposit welcome bonus. Plus you will also get access to an 1150% bonus package, entitling you to 3 large deposit bonuses over your first 3 deposits, starting with a very lucrative 500% welcome bonus. Details on how to claim your welcome package can be found on this review by BingoMum. Launched in 2012 and part of the Live Bingo Network, Scrummy Bingo has established a reputation for quality. You will find nothing but the best bingo games, with brilliant features too. You will be able to take part in online chat games, as well as grab extra free coupon codes for added cash. The site itself is great for beginners, thanks to it’s use of Cozy Games technology. Other sites that use the same Live Bingo Network and Cozy Games software, include the like of Comfy Bingo, Buttercup Bingo, Mummies Bingo and more, all of which are great fun to play with and have a superb reputation. The registration process is super simple, there are ‘join now’ boxes all over the site, simply click one, fill out a new player profile, verify your email address and away you go. Card details are however required in order to get access to the £15 free no deposit needed bonus, however, this is the law at every single bingo site nowadays, so it’s nothing to be concerned with. Once you are registered you will then be able to make a deposit to claim your 500% bonus, IE deposit £10 and play £60, or you can just browse and have a look at exactly what is on offer. Players will want to check out the Scrummy Bingo mobile app. Getting access to it is super simple, all you need to do is use the login form through your smartphone or tablet device and away you go. You will find full Android, Blackberry, iPad and iPhone support, so you can rest assured that all popular mobile devices work. You can also, obviously, play from your standard desktop PC or laptop should you wish. 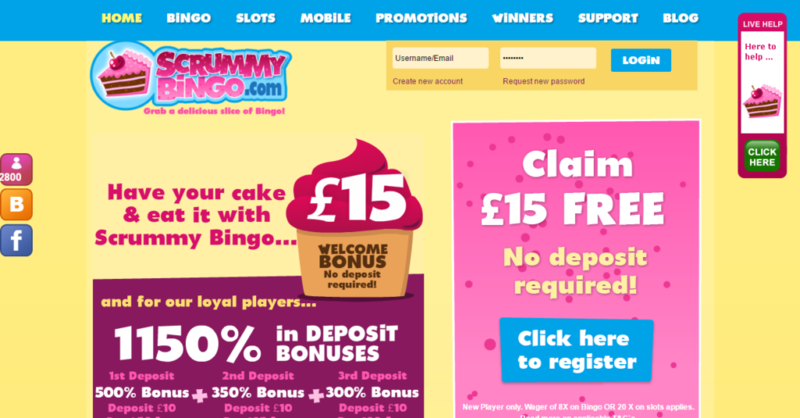 Scrummy Bingo is definitely one of the top Live Bingo Network sites out there. With no deposit required, it’s risk-free to get started, so what do you have to lose? Get started now and claim your free cash, try out all the games and then take things from there.